Last year I counted the shocking comeback wins, and the terrible meltdown losses. I was a little surprised at the end of the year to find out that we had only two of each. Last night Tacoma had its first of either category in 2011: a shocking win, scoring four runs with two outs in the ninth inning when all hope seemed lost. Tacoma stunned Reno for a 9-6 win. The Rainiers trailed 6-5 going to the ninth. They managed to advance a runner to third base, but there were two outs. Matt Tuiasosopo was at the plate – and he was having a dreadful game offensively, going 0-for-4 with two strikeouts and two groundouts to the catcher – just little nubbers in front of the plate. Tui got it done when it mattered most, grounding a single between short and third to bring in the tying run. Then, the floodgates opened. Matt Mangini hit a broken-bat single off the label to right field, sending Tui to third. And then Carlos Peguero jumped on the first pitch he saw a laced a double down the right field line, scoring two runs and Tacoma had a 8-6 lead. Peguero took third on the throw home, and scored on a wild pitch to make it 9-6. All this occurred with two outs – a shocking win, indeed! The Rainiers have won three of the last four games, and are now 3-3 on this road trip after dropping the first two games in Salt Lake City. Tacoma will face Reno tonight at 6:05 (broadcast on 850 AM and streaming live here). Tacoma starts LHP Chris Seddon (0-1, 2.28) against Reno RHP Kevin Mulvey (1-2, 15.00). Seddon was not on Tacoma’s active roster so a move had to be made: outfielder Brandon Haveman was transferred back to Class-AA Jackson. Haveman did a nice job filling in while Peguero was in the big leagues, even helping the Rainiers win a game. I’m sure we’ll see him again in the future. I wrote the game story for The News Tribune. It includes quotes from manager Daren Brown. In the Reno account, Brett Butler wasn’t as pleased by the outcome. The Mariners are playing with confidence and they’ve won four in a row. Read this one: Jim Caple wrote about Michael Pineda. In the PCL, Omaha’s nine-game win streak came to a dramatic end. Wow – Las Vegas has lost nine straight games, and they’re blaming the bullpen. Tucson outfielder Aaron Cunningham is from Port Orchard, and he’s red-hot right now. Ex-Rainiers outfielder Brad Nelson had the game-winning hit for Round Rock last night. Nashville starter Zack Greinke had a good rehabilitation outing, but the Sounds lost. New Orleans beat Round Rock, 1-0, on a Josh Kroeger home run. That’s it for today – I’ve got a treat for you long-time fans tomorrow! Also, don’t forget about the Fan Go-Round at Cheney on Sunday. As you are well aware, David Winfree was one of the leaders of last year’s PCL Championship team. He left the Mariners after the season as a minor league free agent, signing with the Arizona Diamondbacks. Winfree got injured in spring training and didn’t play much, so an assignment to Triple-A Reno was in the cards. Last night he beat his former team with a long home run to centerfield with two outs in the bottom of the 12th inning. Winfree’s third homer of the season gave Reno a 13-12 win. Winfree’s blast was one of six homers for the Aces, who lead the league in home runs by a team. The wind was howling out to right field, but that was an advantage for both team’s hitters – and the Aces out-homered Tacoma, 6-1. Matt Tuiasosopo had a big game for Tacoma, going 3-for-5 with a home run, three runs scored, and five RBI. Alex Liddi and Matt Mangini each had three hits as well. Mike Carp left the game after singling in the fourth inning. It turned out to be a cramp in his hamstring and he should be fine. The second game of the four-game series is tonight at 6:05. Tacoma starts RHP Blake Beavan (1-0, 4.50) against Reno RHP Micah Owings (3-0, 2.81). It will be interesting to see if Reno manager Brett Butler uses a DH for Owings, who is the best hitting pitcher in baseball. The game will be broadcast live on 850 AM and streaming online here. The game ended so late I couldn’t get quotes, but here is my Rainiers game story for The News Tribune. The Reno newspaper’s account has quotes from Winfree. Michael Pineda tossed another gem and the Mariners swept the Detroit Tigers. Even Buster Olney is jumping on the Michael Pineda bandwagon (subscription required). Mariners catcher Miguel Olivo is heating up at the plate. In the PCL, Omaha won its 9th straight game by shutting out Iowa, 7-0. Eric Hosmer had four hits, Mike Moustakas pounded two homers, and Danny Duffy tossed six innings of one-hit, nine-strikeout ball. Salt Lake lost its series opener at home to Fresno, 5-4. Fresno closer Marc Kroon recorded his 200th professional save. Crazy game in Vegas: Sacramento hit three homers in the top of the 13th inning off former Rainiers reliever Chad Cordero and the River Cats won it, 13-9. Each team scored in the 11th and the game clocked in at 4:34. Tucson has a player who’s father pitched for the team 20 years ago. All Mike Clark remembers is the old Toros mascot, Tuffy the Taco. Las Vegas outfielders Dewayne Wise and Scott Podsednik reminisced about Wise’s perfect-game saving catch – one of the best any of us have ever seen. Oklahoma City’s Anderson Hernandez hit a 3-run homer to beat his former team in New Orleans. Memphis catcher Tommy Cruz singled home the winning run in the 10th inning to beat Round Rock, 6-5. Here’s a fun story on teams manipulating scoreboard radar gun readings to get an advantage. A couple of PCL players – but no Rainiers – appear in this week’s Baseball America Prospect Hot Sheet. OK, let’s see if we can get a more normal baseball game tonight – and hopefully one that ends with a Rainiers win. The rested Rainiers will face the Reno Aces tonight in the opening game of a four-game series in The Biggest Little City In The World. Tacoma sends LHP Luke French (0-3, 4.29) to the mound against Reno RHP Matt Torra (1-0, 3.18). First pitch is set for 6:05 pm and you can hear the game live on South Sound Sports 850 AM and streaming here. Reno is 13-6 and in first place in the division. The Arizona Diamondbacks Triple-A affiliate is led by Wily Mo Pena, who is terrorizing PCL pitchers. Wily Mo has hit safely in all 15 games he has played in, and get this: he has at least one RBI in 14 of his 15 games. All told he’s batting .390 with six home runs and 22 RBI. The Aces have two other players with 10-game hitting streaks: outfielder Cole Gillespie and catcher Konrad Schmidt. Former Rainiers star David Winfree is producing, too: he’s hitting .305 with two homers and 18 RBI in 18 games. Former Tacoma Tigers manager Ed Nottle is one of the characters of the game – he once got ejected and put on the Tacoma Tiger mascot suit and went back on the field. John McGrath wrote about him in a preview of Sunday’s “Fan Go-Round.” A description of Sunday’s event including a list of players attending is on the event flyer. It sounds like we’ll be keeping David Aardsma on the roster for a while longer. Ryan Divish has a close-up on reliever Dan Cortes, who was making strides with Rainiers pitching coach Dwight Bernard before his promotion. Justin Smoak is hot and Erik Bedard picked up his first win since 2009 – the M’s are playing well on the road! We had a very rare event in the PCL on Tuesday night: Oklahoma City’s Koby Clemens (Roger’s son) hit two home runs in the same inning at Round Rock. Notes from Fresno: Brandon Belt has moved to the outfield, and PCL stolen base leader Emmanuel Burris was called up. Omaha’s Clint Robinson has been one of the top hitters in the PCL, but he gets no respect. The Tucson Padres have been bumped from their stadium by a mariachi festival. I did not make that up. So they’re playing Saturday’s game across town at Hi Corbett Field. Life in the year 2011: Ozzie Guillen got ejected in the first inning, went back to his office, and tweeted about it. We missed Ozzy performing at our Reno hotel by three days, but the Muppets are in town. Maybe I can secure Kermit The Frog for Sunday’s feature interview. Tacoma made it two straight wins by beating Salt Lake on Tuesday night, 8-4. It was an all-around team effort: Fabio Castro had an excellent start, the bullpen was solid, and everyone in the lineup hit. The team went 5-for-11 with runners in scoring position, which has been an early-season struggle for the club. Mike Wilson came off the disabled list and hit a pair of doubles, Carlos Peguero had a two-out, two-run double, Josh Bard knocked a homer, and Alex Liddi hit a tape-measure line drive solo shot. Here is the game story with more details and quotes from manager Daren Brown. After 20 straight games, the Rainiers have their first day off of the season today. The team lands in Reno in the mid-afternoon and gets a relaxing evening off. In the PCL we get one day off a month, and having it on the road is not a good thing. But we’ll make the best of it – personally, you will be able to find me either at the Sierra Nevada Tap House (yum yum) or in a No-Limit Hold ‘Em game at one of Reno’s finest downtown gambling palaces. Tacoma’s next game will be Thursday at 6:05 in Reno. I’ll be back with a full blog post beforehand. After losing ten out of 11 games, the Rainiers finally broke through for a 5-4 win on Monday night in Salt Lake City. It took 12 innings, lasted 4 hours and 5 minutes, there was a 55-minute rain delay (not included in time of game, so the game lasted five hours), and the last three innings were played in a steady rain with about 12 people in the stands, but it’s a win. Dustin Ackley hit the game-winning two-run double in the top of the 12th. With the score tied 3-3 and runners at second and third and one out, Ackley drove a Horacio Ramirez pitch over the head of the left fielder for a two-run double. It was only the second hit Ackley has had against a left-handed pitcher this year, and obviously it was a big one. Ackley never would have gotten a chance if it weren’t for the heroics of Cesar Jimenez in the bottom of the 11th. After allowing a leadoff double and wild pitching the runner to third, the Rainiers chose to intentionally walk the bases loaded to set up a force at the plate. Jimenez then struck out three straight batters to escape the jam. It was an impressive bit of clutch pitching, and Jimenez ended up with a very deserved win. The Rainiers have a chance to split the series with a win tonight – and that would be quite an accomplishment given what has happened over the last two weeks. Game time is set for 5:35 (Pacific, 850 AM and streaming here). Tacoma starts LHP Fabio Castro (0-2, 8.03) against Salt Lake RHP Matt Shoemaker (0-1, 8.79). Tonight’s game is questionable – we’ve had snow flurries this morning in SLC, and who knows what’s in store for us tonight. If we can’t play, the game will be made up as a part of a doubleheader when the Rainiers return to Salt Lake City, July 22-25. If it gets postponed I’ll post it here on the blog right away. Mike Wilson took batting practice yesterday and felt good. He could be activated from the disabled list as soon as today. Wilson separated his shoulder crashing into the outfield wall in the fifth game of the season, April 11 at Fresno. Alex Liddi had his first day off yesterday, and Matt Mangini slid over to his old position of third base. Josh Lueke pitched very well in his first game back at Tacoma, working 2.1 scoreless innings. Chaz Roe had his third straight good start, allowing just one unearned run while he was on the hill – although the runners he left on base when he left the game with two outs in the sixth ended up scoring, tainting his stats. Hopefully we’ll get this one in today. As a RG, I officially hate doubleheaders (as a fan I kind of like them). I frantically wrote the Rainiers game story for The News Tribune well after the paper’s deadline last night – it’s just a bunch of play-by-play. There a some Bees tidbits in the Salt Lake Tribune’s game story. The Mariners were off yesterday, so the papers ran feature stories: The TNT has a story on Adam Kennedy, and the Seattle Times focused on Jamey Wright. Ryan Divish is on the Mariners road trip so that means lots of blog posts. Here he compares Jack Cust to Brad Wilkerson. I need Divish to show me how to post a neat chart like that in a blog. Former Rainiers catcher Jeff Clement is the focus of this excellent story from Fox Sports. Mariners Farm Review has a look at three players who are off to interesting starts for Class-A Clinton. In the PCL, we have some hot teams. Colorado Springs won its fifth in a row last night despite making five errors. It was the first time in ten years that the Sky Sox have won a game in which they made five errors. Omaha has won eight straight games. They beat Nashville in the ninth inning last night. Reno won at Fresno last night, 6-2. The Rainiers face Reno next – Collin Cowgill had three hits and two RBI for the Aces last night. The Aces got Wily Mo back in the lineup, but ex-Rainiers shortstop Josh Wilson was called up by the Diamondbacks. Anthony Rizzo is still red-hot for Tucson – he had three hits with a homer at Sacramento last night, and he’s batting .432-7-26 for the T-Pads. We’ll see him on Monday at Cheney if he doesn’t get himself called up first. Not only is Zack Greinke rehabbing with Nashville, now they have Corey Hart in the lineup. When do Braun and Fielder arrive? I almost forgot to post this: yesterday was Free Tree Night in Salt Lake City. 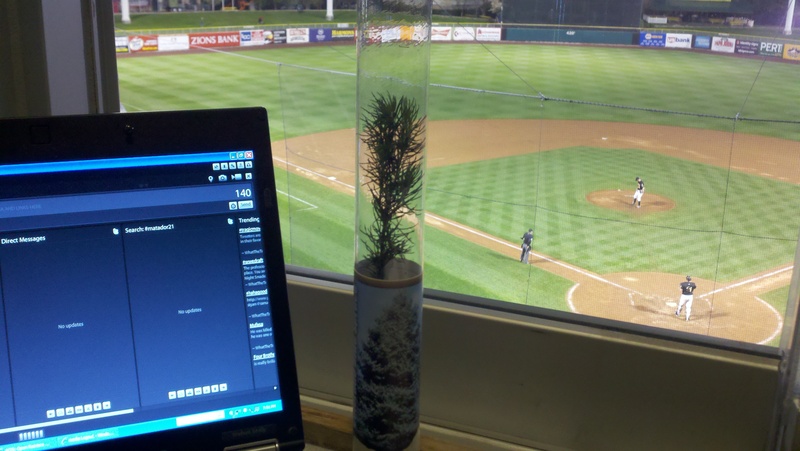 Courtesy of the Bees Hannah Lee, I received my free tree. I’m going to plant it and raise it and nurture it. Remember, even the smallest acorn can grow into a Mighty Oak. I can’t believe they didn’t cover the container with Salt Lake Bees logos. We had some roster moves before tonight’s game in Salt Lake City (5:35 pm Pacific, RHP Chaz Roe vs. RHP Eric Jonge, 850 AM and streaming here). Tacoma received reliever Josh Lueke and outfielder Carlos Peguero from the Mariners. Both are here and ready to play – Peguero is in the lineup. Reliever Dan Cortes was called up to Seattle, and reliever Justin Miller was released. Miller had been one of Tacoma’s top relievers. My understanding is that Miller’s release was a mutual decision between he and the Mariners, so that he could pursue a better major league opportunity with a different organization. I apologize for the lack of a full blog today. There was no internet available at the hotel because they were “changing servers.” Apparently, this is going to be the Season Of Hotel Internet Problems – it was slower than dial-up all four days we were in Fresno. It’s always something – last year was the Season Of Lost Radio Guy Luggage, and two years ago was the Season I Kept Getting Sick. Since I couldn’t get online I wandered around downtown Salt Lake City and came to the ballpark early to use the WiFi here for my game preparation. I found a nearby coffee shop I can use tomorrow if the internet is still down at the hotel, so I promise a full entry Tuesday. Different location, same result: the Rainiers opened an eight-game road trip with a 9-8 loss in Salt Lake City on Saturday night. The first game of the road trip was eerily similar to what the Rainiers did on the just-completed eight-game homestand. Tacoma stayed in the game and lost by one run, and the defense was the culprit once again. Tacoma was charged with three errors last night, and it should have been more. Chris Pettit’s “three-run double” in the bottom of the eighth inning should have been called an error, and the Rainiers also had some mental mistakes (pitcher not covering first base, etc). The Rainiers have lost nine of the last ten games, but I still think that this will be corrected soon, and here’s why: five of the losses have been by one run, two by two runs, and one by three runs. During this dreadful stretch, Tacoma has only been beaten badly one time (the 13-1 loss to Colorado Springs on Thursday). Clearly, the club is just about as good as the opponent, but bad luck or a big mistake at a key moment is costing them the ballgame. Mike Carp is back. He went 3-for-4 with a homer, and in his last five games he is 9-for-19 with two home runs. He’s even got his average over the Mendoza Line at .210. Matt Tuiasosopo hit two hard doubles and he has reached base ten times in the last four games. Brandon Haveman had two hits, a home run, and three RBI. His first Triple-A homer was a line-drive laser beam down the right field line. Johan Limonta went 3-for-4 with a walk. Today’s game is at 1:05 (Pacific) and the Rainiers send LHP Chris Seddon (0-1, 0.96) to the mound against Salt Lake LHP Manny Flores (making his Triple-A debut). Seddon’s microscopic ERA is endangered in the high-elevation hitter’s paradise of Spring Mobile Ballpark. The pre-game airs at 12:50 and the broadcast will be on South Sound Sports 850 AM and streaming online. I wrote the Rainiers game story for The News Tribune, and also a Minor League Notebook about Mariners power-hitting prospects trying to cut down their strikeouts. Here is the Rainiers-Bees coverage from the Salt Lake Bee and the Deseret News. The Mariners lost to Oakland yesterday, ending the streak of shutout innings pitched. Franklin Gutierrez has a diagnosis. Larry Stone wrote his Sunday column about the demise of the Dodgers. His notebook always has some good nuggets, and his power rankings are all one-liners. In the PCL, snow and Eric Young Jr. saved the Sky Sox last night. Brand Belt reported to Fresno and launched a bomb in his first at-bat – but the Grizzlies lost to Reno, 9-2. This story on Sacramento’s road success refers to Cheney Stadium as a hitter’s park. It might be true now. Jemile Weeks hit his first Triple-A home run last night. This story on former PCL Most Valuable Player Jose Ortiz has some great facts about the award. My man Wily Mo Pena is out with a groin injury right now, but that doesn’t mean we can’t have a Wily Mo Lovefest. Money quote: “Pena has always been known for the majesty of his home runs…”. Everyone stops and watches when its his turn in batting practice. This is an entertaining read. Memphis came home from a tough road trip, had a big crowd, and ended a five-game losing streak. Just the opposite, Round Rock won seven straight road games, but returned home last night and got stymied by Jordan Lyles and the RedHawks. Zack Greinke starts for Nashville today against Omaha, who has won six straight games. Should be a good battle. Ex-Rainiers pitcher Brandon Morrow made his season debut for Toronto last night. Off to the ballpark for another chilly game in Salt Lake City! You are currently browsing the Booth, Justice and the American Pastime blog archives for April, 2011.